Karrar Al Khammasi is accused of shooting Colorado Springs Officer Cem Duzel in the head, leaving the Duzel in critical but stable condition. Image courtesy of Colorado Springs PD / Facebook. 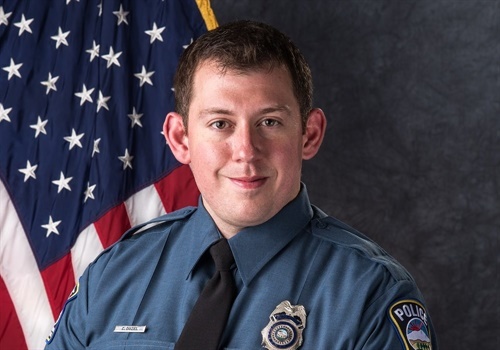 A man accused of shooting a Colorado Springs police officer in the head last month was reportedly bragging about it while in the hospital recovering from gunshot wounds, according to the Colorado Springs Gazette. Karrar Al Khammasi is accused of shooting Colorado Springs Officer Cem Duzel in the head, leaving Duzel in critical but stable condition. While in his hospital bed, 31-year-old Iraqi immigrant reportedly described shooting cops as "what I do," and threatened to kill a deputy and other officers. Al Khammasi had a series of arrests—including drunk driving, felony trespassing, and criminal extortion—during the past five years, but somehow managed to avoid deportation. A Department of Homeland Security official who spoke to The Associated Press on condition of anonymity says Al Khammasi was ordered to be removed from the country in June 2016, but that the proceedings to deport him were ended in October of that year.